One of the things I’ve found as a home-maker is that the little things I do (or put my mind to) every day add up to the bigger things I’ve always dreamed about for my home and family. Joy and contentment right where we are, with what we already have, is all we really need. For those of you who are new around here, I wrote a book called Love The Home You Have that was released last March, 2015. My book was about finding contentment where we are and it focused on the simple things we can do at home to reorient our perspective to what it takes to find joy in what we have and where we live. It’s how you look at what you have and what you do with it every single day that changes everything. At the back of Love the Home You Have is a 31 day Love Your Home Challenge, featuring 31 small home decor projects, fun tasks to inspire you, and even focused cleaning frenzies that will not only make it a treat to transform your home, but will bring a sense of direction and happiness to your day. Home-making looks so easy and beautiful on Instagram, doesn’t it? But in real life we can see the full 360 degree view and it isn’t always as pretty as we wish it was. Spring has been a long time coming. I think we are all ready for a little sunshine and along with it, we could use a little home refreshing. To motivate myself and to encourage you too, I’ll be offering two upcoming challenges this spring here at The Inspired Room that I hope will bring the spring back into our steps. First of all, this upcoming week, will you join in the 31 Day Love Your Home Challenge? 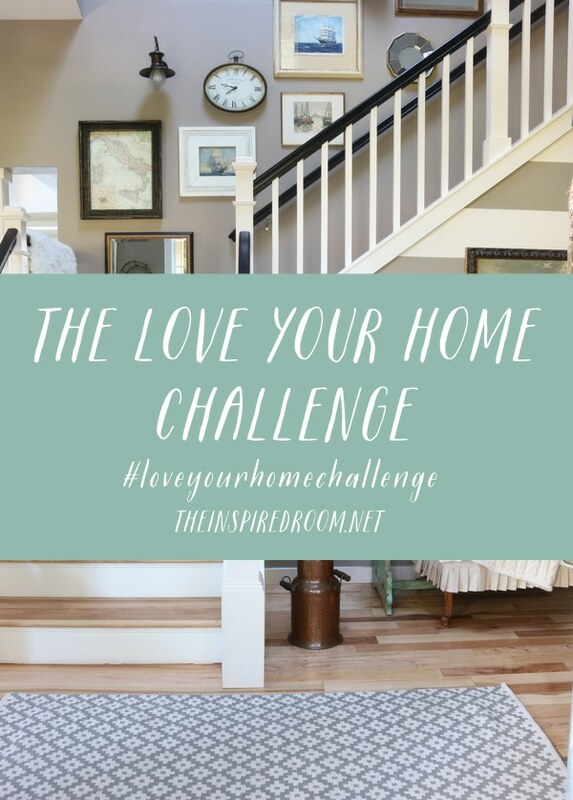 Every Sunday (starting this weekend) I will post the week’s challenges (based on the 31 Love Your Home Challenges in the back of Love the Home You Have) here on the blog. You can get the book to follow along and to get some extra encouragement if you’d like to. Even if you completed some of the challenges previously, they are good ones to repeat or challenge yourself to take them to the next level. Check the blog post each Sunday for an easy to follow list of 7 simple ways you could love your home in the upcoming days, along with a little extra pep talk or some encouragement to get you through the week. Do the ones you can or complete them all, it’s up to you! I’ll post the day’s challenge once a day on Instagram, too, if you follow me there (@theinspiredroom). If you’d like the extra motivation to stay focused or you just want to have a fun topic to share with kindred spirits, you can post the results of your challenges on your own blog or Home Love Stories (no blog required), or share on your Instagram, too! Use the hashtag #loveyourhomechallenge if you share so I can find you! But whether you decide to share or not, I hope you’ll follow along and let me know how you’re doing. Then to keep our momentum and energy up, later in April I’ll post about a brand new challenge and we’ll keep on showing love to the home we have. It’s going to be fun. 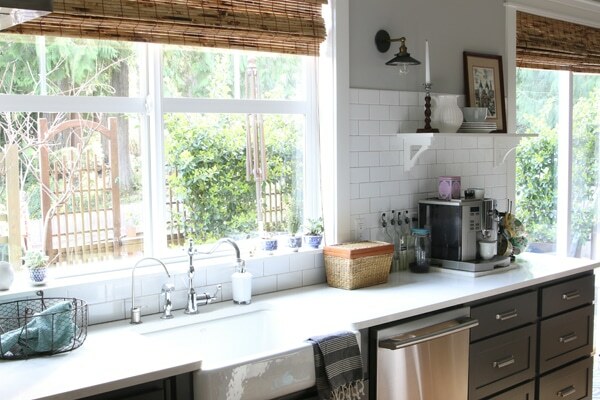 Dreaming about a remodeled kitchen (or what it might feel like if you tore out a few walls here and there) can help you to imagine how you might love your home even more. I love dreaming! But dreaming big isn’t the only way to love the kitchen you have. In fact, sometimes the smaller projects bring as much joy (or a more special kind of joy!) as the bigger ones. It is all in the way you look at what you have, isn’t it? To really love your kitchen and be happy with what you have, I think the actual decisions about how to update it have to spring from reality. Questions like what we can live with and what do we think is essential or are reasonable updates for this kitchen, this house and this season of our life? Remodeling isn’t always an option or even necessarily the best choice in every situation, but I believe every kitchen can be made more lovable. There are always tips in magazines and blog posts that might seem pretty boring (like, DUH! I know I can do that) but let’s explore how to take an idea that might seem obvious and actually use it to make a kitchen fabulous. Here are five ways to show more love to the kitchen you have, without a major remodel! 1. Fix What You Don’t Like. It is funny how a feature we don’t like becomes almost like a beacon of light, pulling our attention right to it. Every day we think about it. Even if no one else would notice it, WE DO. If you don’t like it, it might seem like an obvious question, but what CAN you do about it? What we CAN do might not be as perfect as what we WOULD do if circumstances were different, but it is what we actually DO that will make the difference. So many times over the years I have found all it took for me to love my room more was a little creativity to conceal features I didn’t like. 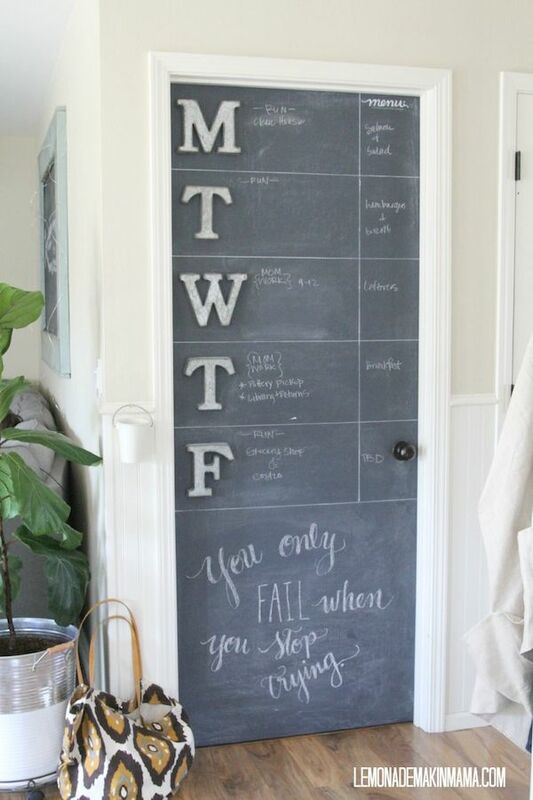 Chalkboard paint is one of those concealing miracle workers, isn’t it? I had a door in my English kitchen that just felt like it was out of place. It was a ho-hum brown oak door when the rest of our house had more charming painted doors and wood work. I dreamed of a new door for years until one day I had an idea, instead of hating it for one more day I could fix it! We painted it with chalkboard paint (we used this brand) and it went from being an unfortunate feature to a feature I really loved. 2. Feature walls are still cool. Extensive remodels can be amazing, but you don’t have to remodel the whole kitchen to get a new look. Focus on one wall and give it the WOW factor! Brick walls are always a dramatic focal point. 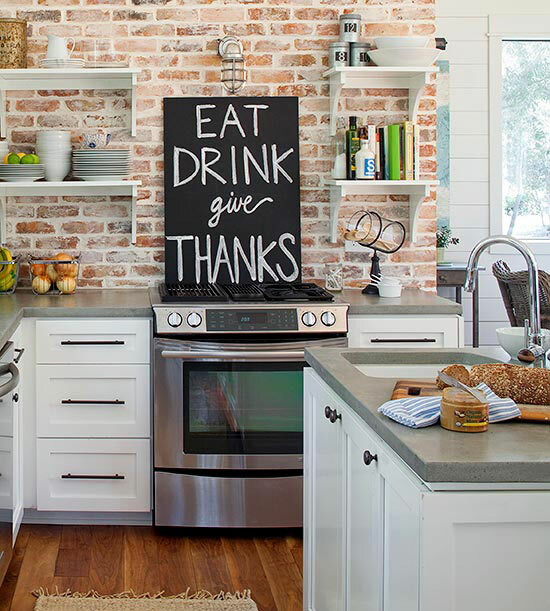 Try a brick veneer product for a DIY treatment (like this brick) and even great looking brick wallpapers (I think this brick wallpaper looks pretty realistic, doesn’t it?). A feature wall might be the best thing that ever happened to your kitchen! 3. Freshen it up with white. A dark kitchen might tempt you to gut the whole thing to get your dream kitchen. But as cliché as it might sound, it’s true. White paint can do wonders. It can prolong the life of your kitchen, offer a fresh backdrop to the heart of your home, or give you your dream kitchen on a budget that you can live with. What would it take for you to love your kitchen more? If it is within your budget and makes sense for your home and family, it might be worth the investment. 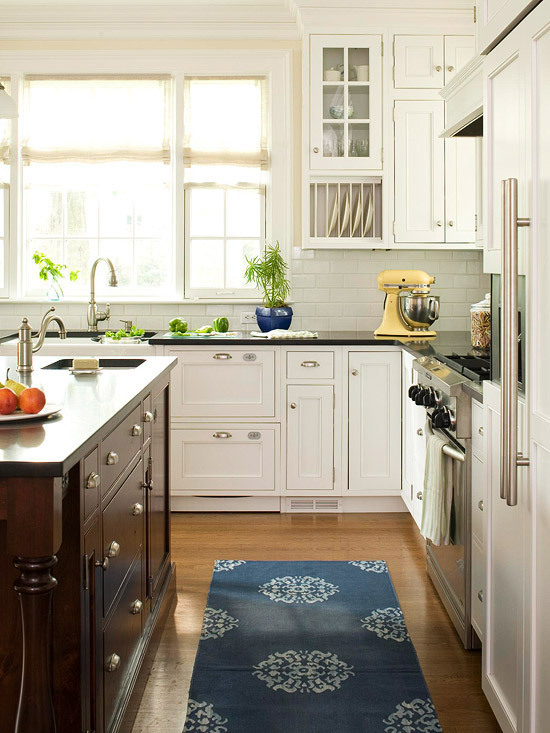 Appliances aren’t cheap, but they too can freshen up an outdated kitchen. 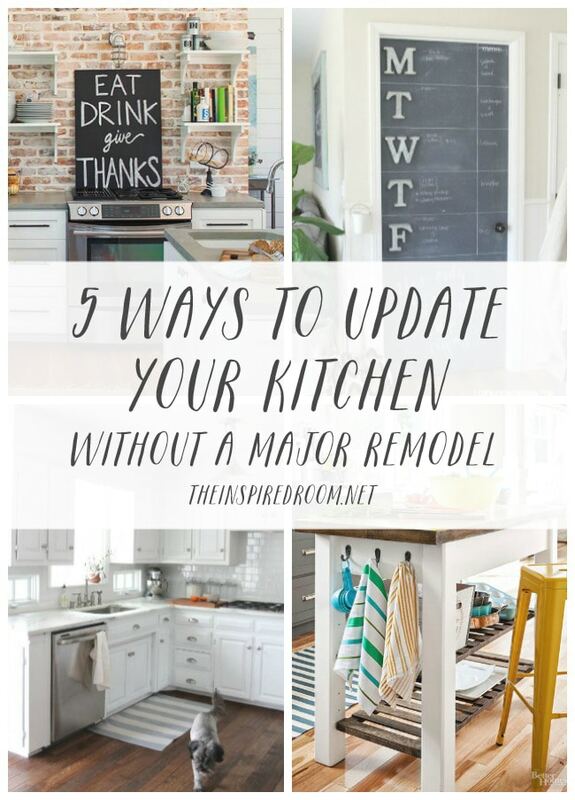 There are many ways to update a kitchen without a complete remodel. Simple changes can give you what you really want, the opportunity to love working in your kitchen on a reasonable budget. My kitchen island in BHG! 4. Add a cheery personality with pattern. 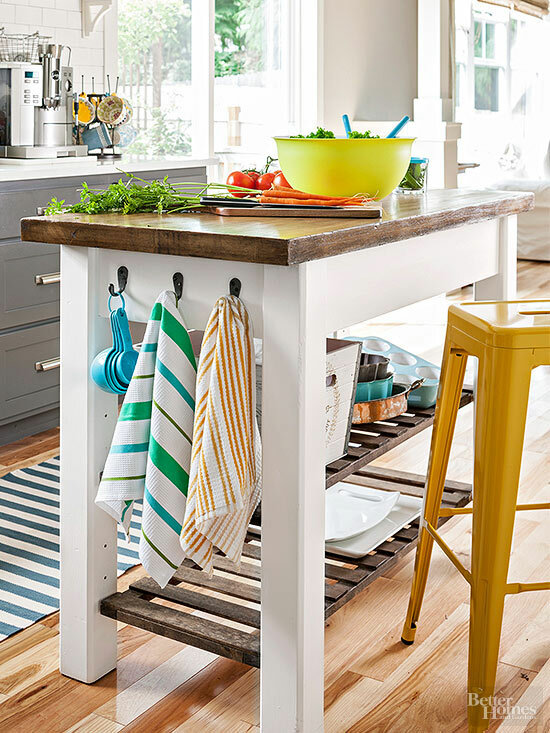 Perhaps the simplest way to bring your own personality to a kitchen is to add a pattern you love through runners, throw rugs, window treatments (tea towels can make adorable cafe curtains) or hand towels on hooks. Yes, this tip might seem to be one of those updates that doesn’t work as well if you don’t have a perfect backdrop to show off the tea towels. But I can say after touring hundreds of houses for sale online and in person when we were house hunting, there were many original “unremodeled” kitchens or more basically updated (i.e. 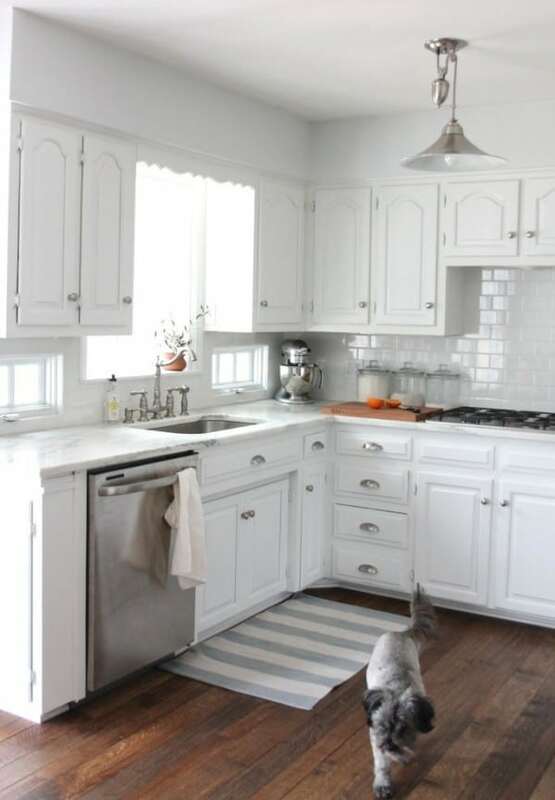 boring or standard) kitchens that would have improved (or benefited) from cute towels and rugs! Kitchens will always feel more lovable if they are cheery! “Add a pop of color” might be the most overused phrase in home decor, but the truth is if you do it right, it works. Color draws your eye towards something you want people to notice. If the rest of your kitchen isn’t bringing you rave reviews, focus on something that will! 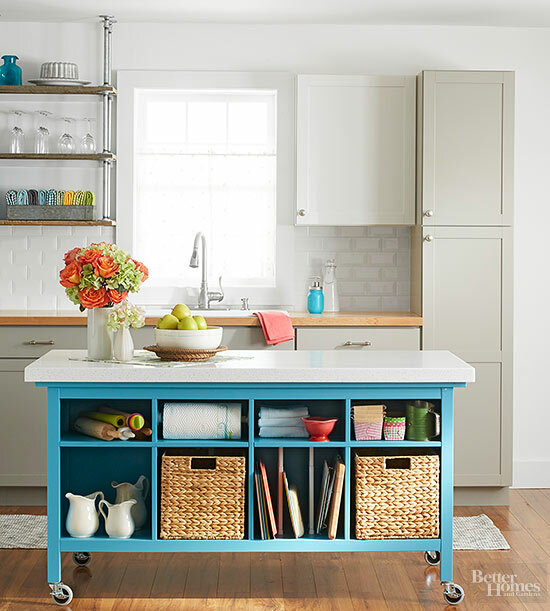 Paint an island, the walls, your table or chairs, window trim, your cabinet doors, backs of cabinets, a free-standing cabinet, rugs or accessories are all places where a new color might transform the feel of a kitchen. Does your kitchen need a little TLC?